Early bird discount available until May 8th. 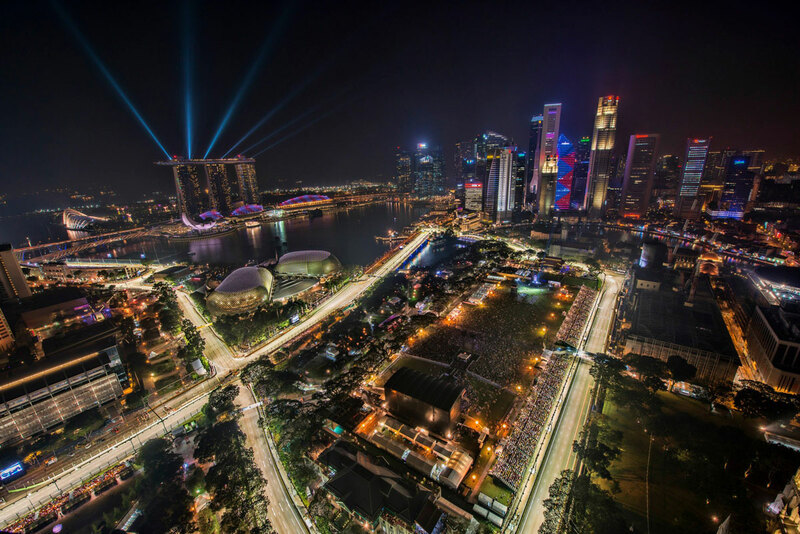 Buy Singapore Grand Prix tickets from these official retailers. 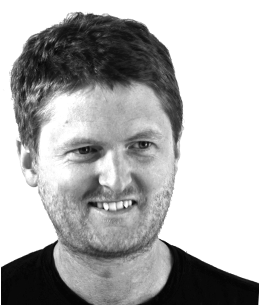 The Singapore Grand Prix is such a unique event I don’t imagine anyone going away from it disappointed. It does suffer the same problems from a spectator’s point of view as just about any other street circuit. The many buildings create a narrow field of vision and catch fencing is ubiquitous. Wire mesh fences never improved anyone’s Grand Prix photos but happily they are easily forgotten while watching at the track. 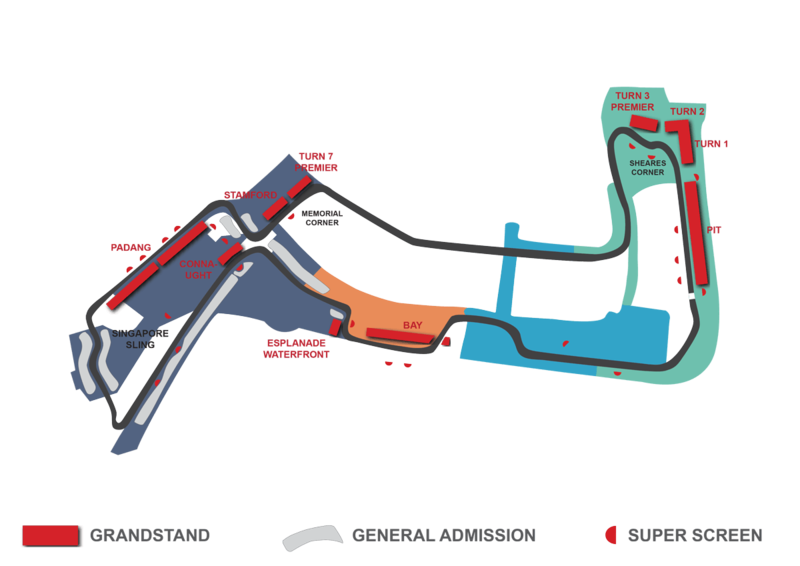 Unusually for a Grand Prix circuit, Singapore street circuit is divided into 4 zones and having a ticket doesn’t necessarily grant you access to the whole circuit. Whatever zone a grandstand is in, ticket holders will have access to that zone and all higher numbered zones as well. For example, zone 2 ticket holders can access zones 2,3 and 4 but not zone 1. Zone 4 tickets allow access to zone 4 only. Just marginally more expensive than Zone 4 walkabout tickets, the Bay stand might seem good value for a grandstand. So how good is it and is it worth the extra cost? Views from the grandstand are very limited and this is not the most action packed stretch of track. It’s not every year that a misguided rookie driver deliberately wrecks his car in front of this stand; you’ll mainly be watching cars sprint along the short straight past the stand and disappearing before you can say ‘auto-focus’. Its not all bad though. Fans with Bay Grandstand tickets are free to explore Zone 4 and benefit from the extra vantage points that offers with the knowledge that once your feet get tired and sweaty you have a reserved seat to return to. The Bay Grandstand can be compared to Monaco’s swimming pool section in terms of the atmosphere in this massive stand. 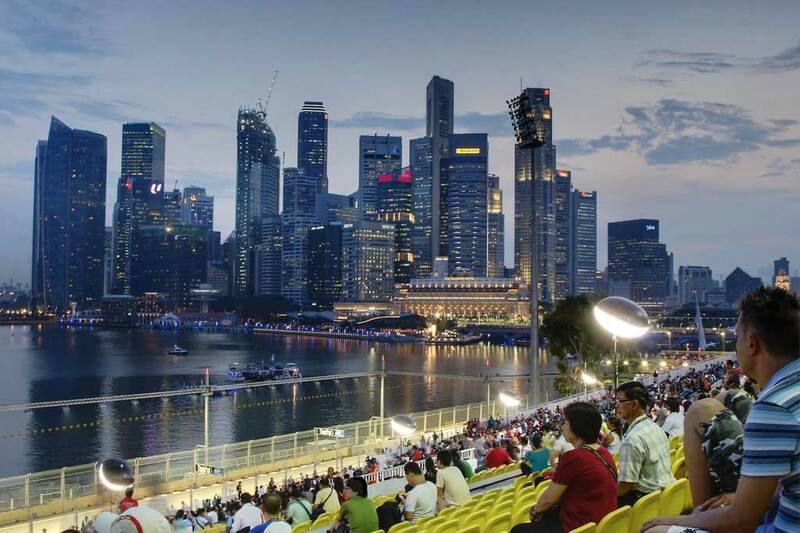 The backdrop of Marina Bay is unforgettable and you’ll be in a prime position to watch the post-race fireworks. For watching a Grand Prix in Singapore or any other street circuit its always better to watch the race from somewhere that gives you a sense of the city’s presence and character, rather than a background of some generic mish-mash of catch fencing and advertising hoardings that could be anywhere. Its like if you go on holiday to Paris; you’d rather have a view from your hotel room of the Eifle Tower than your neighbor’s clothes line. The best seats to be in if you want to be in the heart of the action. The Pit Grandstand overlooks the main straight in Singapore as well as (no free tickets for guessing this) the pits. Views of the racing might be lacking – it is a straight after all – but you’ll never get tired of the people watching in the pitlane as well as the pre and post race shenanigans. At the end of the race follow the throng of people onto the track to applaud the winners. The anticipation of the start and the often chaotic first lap of the race is nowhere more keenly felt than at these grandstands that line turns 1 and 2 of the Singapore street circuit. The start was the scene of one of the most memorable moments of the 2017 season when Sebastian Vettel took out his Ferrari team mate, Max Verstappen and himself in an unintentional kamikaze attack. If its action you seek, look no further. Tickets for Grandstands T1 and T2 are very similarly priced and have slight variations of views of the same section of track; which one is better is largely down to individual tastes. For Turn 1 Grandstand spectators, cars enter from the left, giving you a brief side-on view; the rest is mostly the rear of the cars through the turns. This grandstand enjoys a better view of the first few corners as the cars turn sharply into turn 1 and snake their way through turns 2 and 3 before disappearing. Seated in T2 Grandstand you’ll see more of the start/finish straight, pit action and a more preferable head-on view of the cars approaching turn 1, but a less clear view through turns 2 and 3. Positioned opposite the exit to the pitlane, between turns 2 and 3, Turn 3 Premier Grandstand is arguably the best view at the Singapore Grand Prix. You won’t see the grid from here but you have a very clear view of all of turns 2 and 3, which is a lot more than the millisecond of action that most seats at the venue afford. Desirable views aside, what other benefits come with this ‘Premier’ grandstand and do they justify the eye-watering ticket price? 5 drink vouchers (beer, wine or soft drinks). amenity pack with earplugs, poncho and other goodies. It’s a lot of extra moolah for these extras but with views that are unbeatable, for some fans the extra level of comfort and convenience will be worth every cent of the ticket price. There are several lower priced grandstands located in Zone 4; Stamford, Connaught, Padang and Empress. Unfortunately the positioning of the stands tend to be too far from the turns to fully appreciate the racing, and watching F1 cars driving a straight line gets boring surprisingly quickly. There is one clear winner that’s a solid choice but for the others a walkabout ticket is probably preferable, at least giving you the chance to move around and find a new exciting view from which to appreciate the show. Of course grandstand ticket holders in this zone are free to do so as well and for many fans, having a guaranteed seat, whether you choose to use it all the time or not is a very desirable thing in Singapore’s extreme heat and humidity. The Stamford Grandstand is positioned at the exit to turn 7, as the cars come of the fast Raffles Boulevard into a series of 90 degree turns. The view is a little underwhelming and its certainly not a place you want to be sat for three days. If you’re looking for weekend tickets this is one to avoid. 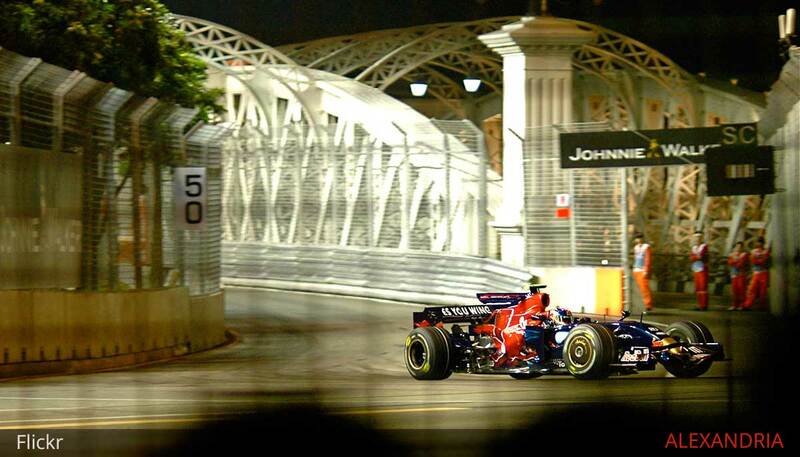 Connaught lies near the end of the Esplanade Drive at one of the highest speed parts of the track before braking sharply into the tight turn 14. This is one of the best grandstands at the circuit to see the immense speed and equally impressive braking ability of a Formula 1 car. Most seats are a little too distant from the corner and although you might see drivers going wheel to wheel here, overtaking is unlikely. Certainly not a bad grandstand but there are better views to be had. The backdrop of the colonial style National Gallery is an impressive sight and there are a number of giant screens to keep fans in the Padang Grandstand informed on the action. The track view to the left of the stand in the braking zone of turn 10 is better. This is a section of track that showcases the cars’ speed and braking but its certainly not a common overtaking spot. One extra benefit though is the Padang grandstands’ proximity to the grassy area that hosts the post-racing entertainment. If you’re not that impressed with your views of the track you should be able to at least make up for that for the concert. Rounding turn 11, cars breeze past the Empress Grandstand before flicking left around turn 12 and onto the steel arched Anderson Bridge. Its a medium speed section of the track and one where you get to see cars cornering, which is really what its all about. This is the best Zone 4 grandstand by some margin and if it came down to track views alone would be the best low-priced grandstand in Singapore, period. I’m Empressed! (Sorry). Start saving for your next F1 trip. Get your photos featured here and make some cash. Tell me more. Singapore’s general admission areas suffer the same issues as many other street circuits – you’l be close to the track but with a very narrow view of just one corner. Problems following the race are exasperated by the lack of superscreens. Though many of the best views are to be had through jostling for position at the fence, there are a number of small viewing platforms with bleacher style seats. Bring a cushion if comfort is a concern. There is a small general admission area beside the Esplanade Waterfront grandstand which has a giant screen and English commentary over loudspeaker and is a good place to keep up with the race. It’s also quite a fun place to watch the drivers throw their cars into the chicane before stepping on the loud peddle again to blast past the Bay Grandstand. Unfortunately it is mostly the side and rears of the cars that you see. The area between the Conaught and Padang stands where the two corners nearly meet, offers probably the best view in general admission with cars heading straight for you before quickly turning right. Overtaking here is a possibility too. It’s true these tickets aren’t cheap for general admission tickets but they still come in at less than just about any grandstand ticket and if you plan to attend all 3 days at Singapore they are some of the best tickets to have. They allow access to all 4 zones and a great many more viewing areas than the Zone 4 ticket allows, including some of the best general admission views at turns 4 and 5 and towards the end of the lap in the interior of the track near the pitlane entry . Single day race goers might find they don’t have time to realize the full value of these tickets and a Zone 4 pass will suffice, but for anyone staying longer and wanting an alternative to a grandstand I couldn’t recommend this highly enough.